JT has announced another nine dates on his 2019 U.S. tour with special guest Bonnie Raitt starting February 5. Tickets for the original seven dates are now available for pre-sale and the newer dates will go on pre-sale October 15. See the Tour page for all the details including fan pre-sale information. 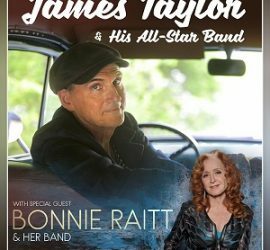 JT has announced an early 2019 U.S. tour with special guest Bonnie Raitt starting February 5. The first seven dates go on pre-sale October 9 with ticket details on nine more dates to come the same day. See the Tour page for all the details including ticket pre-sale information.